Nobody likes to the airport and find out that they packed way too much. Carry on and regular checked luggage weight restrictions have been enforced more and more in recent years. So how can you guard against excess luggage fees and the embarrassment of having to ditch some stuff at the airport? Well, luggage scales of course. 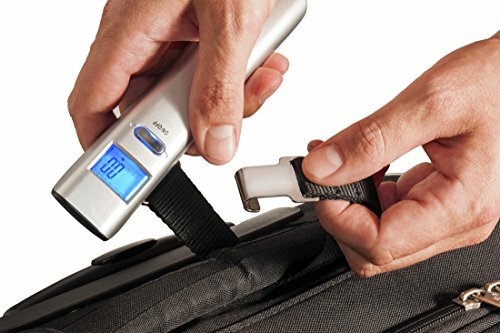 There are many travel-size scales that are excellent for very little money nowadays. Some even offer a few bells and whistles. So without further ado, here are what we see as the best travel luggage scales. 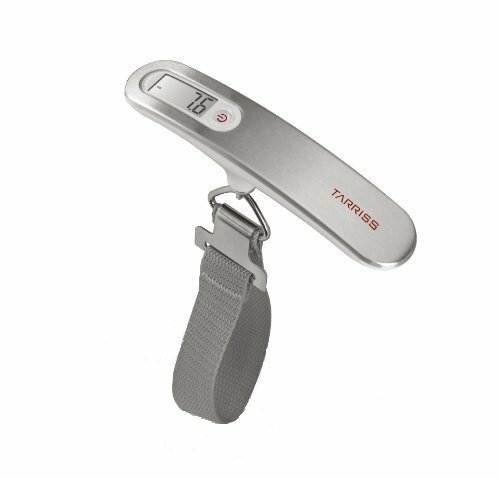 Balanzzahas managed to make a very accurate and durable luggage scale with their mini USB model.As the name implies, this model charges via USB and its internal lithium ion battery. 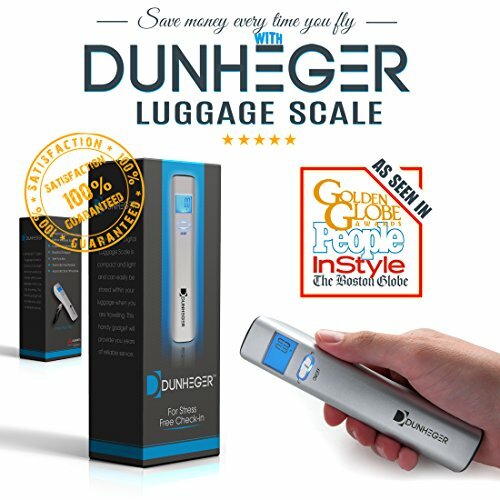 This is a welcome addition to the luggage scale market. We were very sick of changing batteries on our units all the time. 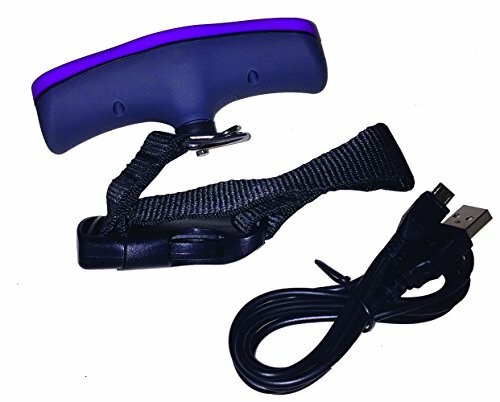 The unit is super simple to operate and surprisingly ergonomic considering the very reasonable price. 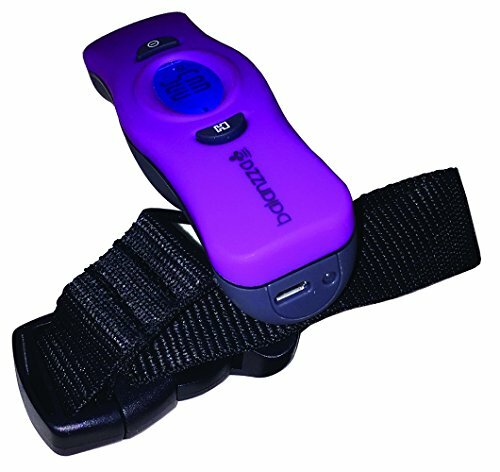 You can easily slip this unit into your bag and not really know its there, until you need it. The scale comes with a 5 year warranty too. 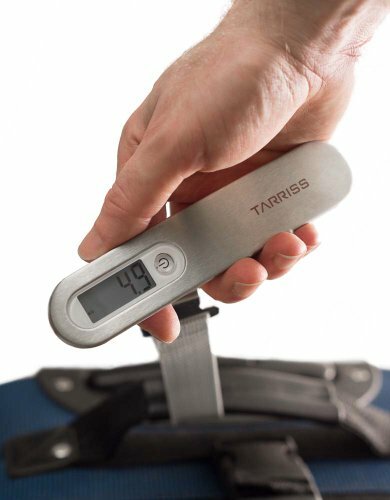 Overall, if we had to recommend one travel luggage scale, it would be this one. 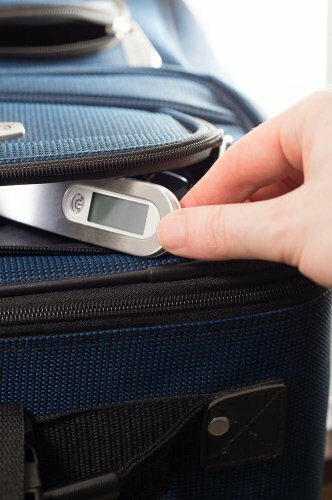 Premium Luggage Scale- USB is a step forward in digital scales design, compact functionality and has the same features of our previous model, the MINI, but Recharge via USB connection, No more changing batteries . This is the quarter generation of our patented Balanzza scales horizontally positioned, with a screen on the top and a strong strap to secure the luggage; offering the most natural way to lift heavy objects. 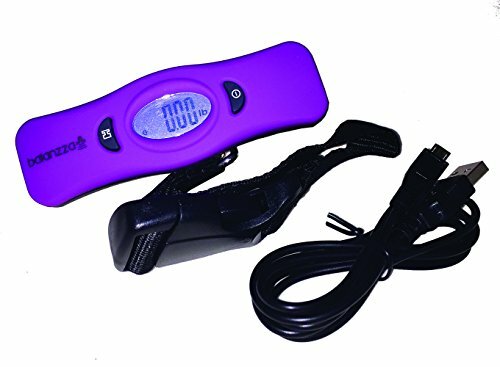 The screen is located on the upper side of the scale, making it easier to see the weight while lifting it with one hand, the user can also wait for the beep to set it down if lifted with 2 hands. Its ergonomic and compact shape lets you lift the objects easily and with less stress to your hands. Its patented structure and functionality make it easy to lift, wait for the beep, and set it down. Use it at home to weigh your children's backpack, or the holiday gifts you are planning to ship, or that occasional parcel that needs to be sent. Make sure to bring it with you on your trips so you are safe from the overweight luggage fees. Even use it at the office for those small and medium size packages that need to be weighed before shipping. In addition to these differences, the Balanzza MINI has the same durability, strength and features as its predecessor and the warranty and quality of all the Balanzza Digital Scales. A very close second is the Tarriss Jetsetter scale. 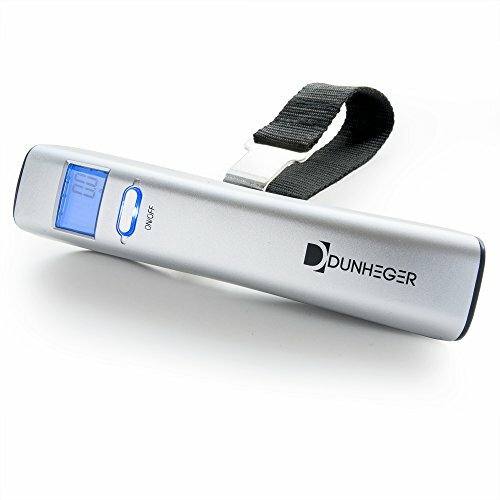 This digital scale has a great aesthetic and is actually slimmer that the Balanzza. Couple that with a full lifetime warranty and you definitely have a choice to make. A 110lb capacity should be good for pretty much anyone and user reviews on this unit are through the roof. 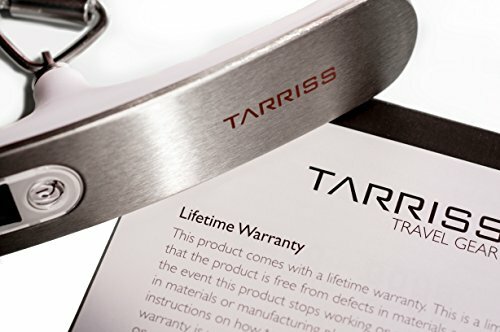 100% Satisfaction Guaranteed and backed by our Lifetime Warranty, something most other brands will not do. As seen in the Huffington Post, Johnny Jet, and the Travel Fashion Girl. 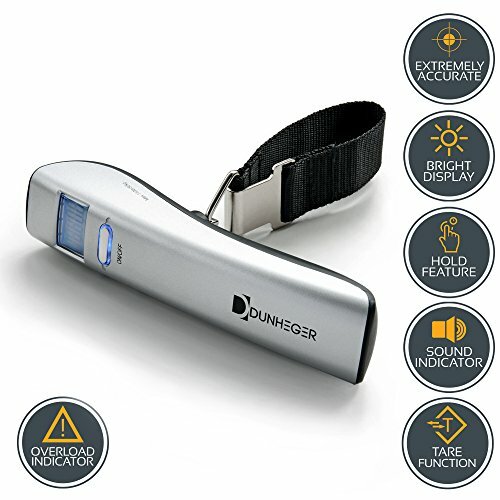 Makes a great travel gift for the hard to buy for traveler! 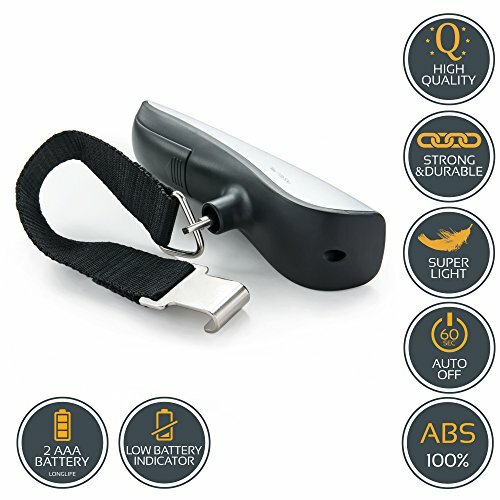 See SPECIAL OFFERS on this travel scale further below on this page. 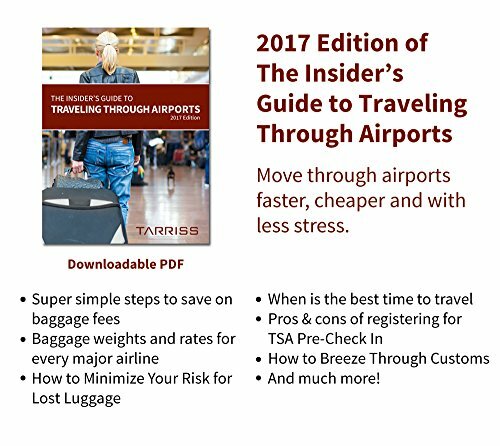 Never pay unexpected overweight luggage or baggage fees again! The best way to make sure you don’t have a super heavy bag and to avoid excess weight fees is simply to pack better! Check out our Ultimate Travel Packing List which lists everything you may need but also gives some great space-saving tips. We included this unit from Dunheger because of its impeccable design (it was even included in the gift bags for Golden Globe attendees last year! ), backlit display and solid ergonomic design. We especially like how this unit can switch between pounds and kilograms with the push of a button. ✔ ACCURATE and extremely precise. This travel gadget weighs in both pounds and kilos with capacity up to 100lb / 50kg. It measures the weight FAST and due to bright BACKLIT DISPLAY and big letters it's very easy to read. 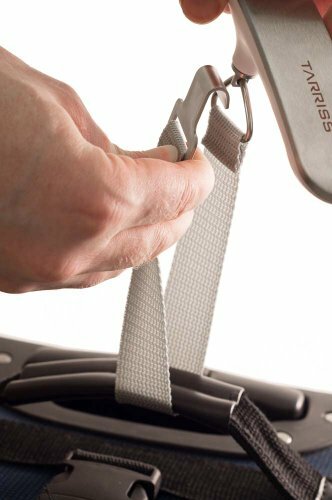 USER FRIENDLY with simple one button operation, it uses strap and buckle (instead of hook) to secure the scale to the bag. BATTERIES INCLUDED (2xAAA). 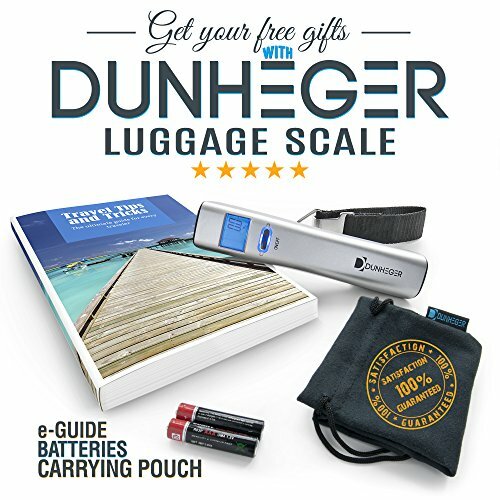 ✔ Helps avoid excess bag charges during FLIGHT or a CRUISE. Perfect for weighing check-in and carry on baggage. It's a great addition to your travel accessories. ✔ MONEY BACK GUARANTEE - order now with peace of mind, consider getting TWO, one for a friend as a GIFT. Even Brad Pitt needs a luggage scale. 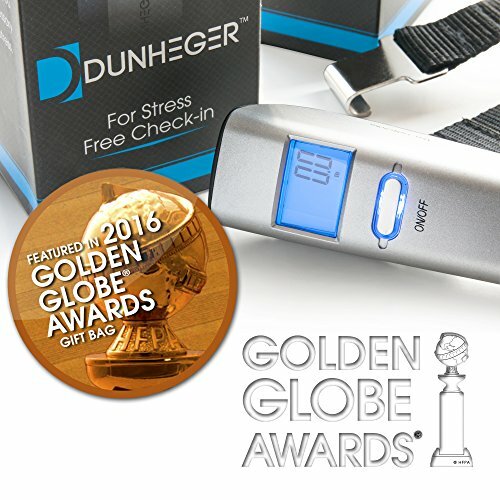 The Dunheger luggage scale was given out at the 2016 Golden Globes! There isn’t really much to these to be honest. But we really like the USB charging capability on the Balanzza. Other than this feature we’d say that the overall best build quality is probably the Tarriss Jetsetter. Any of these three travel luggage scales are excellent value and should last many years.